Lace mourning handkerchiefs, which are used to cover the face of the deceased, are often edged with Bedfordshire lace. Handkerchiefs edged with black lace are not necessarily for mourning as black lace was very fashionable in the 19th century. 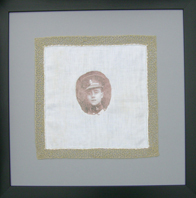 Mourning handkerchiefs are generally regarded as those with oval fabric centres (the shape of the face) rather than those with round or square middles. Opinion is divided as to whether those with fabric in the shape of a cross are also mourning hankies. 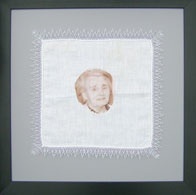 Through the 20th century the demographics of death in the UK have gradually changed and this is represented in these modern mourning handkerchiefs. In the early 1900s the infant mortality rate was at its highest, with 140 deaths per 1,000 births in 1900. This alarming figure had dropped to 80 per 1,000 by 1920 but was still worryingly high. Economic prosperity and the establishment of the National Health Service saw the figure gradually fall to 5.8 per 1,000 births. 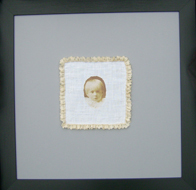 The 1900-20 period is represented by the smallest handkerchief on which the picture of the child is surrounded by a frill of Bucks point ‘Baby Lace’. The two World Wars took a terrible toll on the nation’s population. World War I resulted in over 743,000 military and 8,000 civilian deaths. World War II brought at least a further 200,000 military and 63,000 civilian deaths. As is the nature of armed conflict the vast majority of the victims were male. The handkerchief with the young cavalryman is edged with a braid-like lace in the colours of his uniform. The lace appears, at first glance, to be as random as the young mans chances of survival. It is in fact a very precise and ordered repeat pattern, reflecting the orderly ranks of soldiers who marched away to war. By the end of the century the majority of deaths were from the older generation. In 1991-5 only 12% of deaths were of people under the age of 60. As the wars had wiped out generations of males, by the end of the century, the remaining elderly population was predominantly female. They are represented by the white haired lady surrounded by a delicate Bedfordshire nine-pin edging in lavender and white linen.